Affordable Care Act Health Insurance Will Be Unaffordable in 2018 for Many Middle-Income American Families, eHealth Analysis Shows | eHealth, Inc.
MOUNTAIN VIEW, Calif.--(BUSINESS WIRE)--Sep. 26, 2017-- According to a study released today by eHealth, Inc. (NASDAQ:EHTH), which operates eHealth.com, the average family of three earning slightly too much to qualify for subsidies in 2018 would need to increase its household income by nearly $29,000 before health insurance became “affordable” based on Obamacare criteria. Government subsidies are available to people earning up to 400% of the federal poverty level, but middle-income households earning 401% or more of the federal poverty level are not eligible for subsidy assistance. Of the fifty cities surveyed, only Detroit, MI; Albuquerque, NM; and Pittsburgh, PA showed no affordability gap with the projected 2018 rate increases. These cities are described first in the table below, while subsequent cities are given in order from least affordable (that is, with the largest affordability gap) to most affordable (with the smallest affordability gap). Refer to the appendix prepared by eHealth providing additional context including median age, household size, and income for each of the cities surveyed in this report. eHealth prepared the present analysis by surveying 2017 premiums for the lowest-cost ACA-compliant plan available in fifty cities and/or metropolitan areas. Rates were gathered through the federally-run health insurance exchange Healthcare.gov, with the exceptions of New York, New York (gathered from the New York state exchange) and the following cities located in states not served by Healthcare.gov where rates were gathered from plans offered through eHealth.com: Hartford, CT; Washington, DC; Baltimore, MD, Denver, CO, Santa Monica, San Francisco and Sacramento, CA; Seattle and Olympia, WA. The rates quoted in eHealth’s analysis are for family groups of three in which two adults are aged 35 years. Premium projections for 2018 are calculated as a ten percent increase over 2017. This uniform ten percent projected increase is simply an assumption used for this analysis and is not intended to imply that all plans will uniformly increase at the same rate or to reflect the actual rate increase for any specific plan in any market or for any aggregated set of plans. Each plan in each market will have its own actual rate increase (or, possibly in some cases, decrease) for 2018. 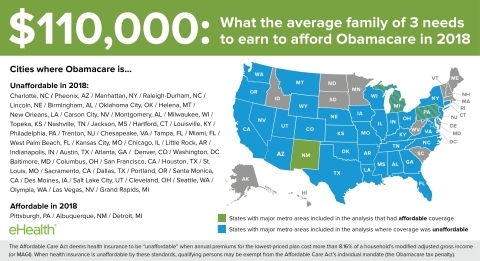 It should be noted that rates may in some cases vary from zip code to zip code within the same metropolitan area or state and that less costly plans may be available in some cases to consumers who do not utilize the health insurance exchanges and marketplaces noted above. In addition, this analysis does not attempt to predict legislative, regulatory, or other changes that may affect the actual 2018 rates for plans. In determining the subsidy threshold – the point at which government subsidies are no longer available to persons purchasing qualifying health plans – eHealth employed federal poverty level guidelines for 2017. Subsidies may be available to persons with a household income of up to 400% of the federal poverty level; as such, eHealth’s described “subsidy threshold” is calculated at 401% of the federal poverty level for 2017. The “affordability threshold” is calculated as the annual household income level at which eHealth’s 2018 premium projections attain to 8.16% of household income. This is the point at which the lowest-priced available plan is considered unaffordable under the rules of the Affordable Care Act for 2017.